Technology “unicorns” heading for IPOs this year, including ride-hailing rivals Uber Technologies and Lyft Inc., could be entering an uncharitable legal landscape. Shareholder litigation against companies that have held initial public offerings is rising, as emboldened investors look to seize on dropped share prices post-IPO due to missteps in disclosures. Meanwhile, dismissal rates for IPO-related lawsuits are falling, which means companies could be engaged in prolonged battles. And large, closely held tech companies are under more scrutiny than ever before, a byproduct of their deep pockets and notoriety. Pair these dynamics with the recent stock market volatility and it’s possible that large tech companies with multi-billion-dollar valuations could find themselves in the cross-hairs of post-listing legal disputes, as several have in the past decade. Both Facebook Inc. and Twitter Inc. were targeted by litigation tied to their IPOs, as were Snapchat parent Snap Inc., Groupon Inc., and Chinese-based online retailer Alibaba Group Holding Ltd. — the current record holder for largest U.S. IPO. Shareholders filed 41 IPO-related lawsuits in 2018, compared with 235 in a ten-year period between 2009 and 2018, according to data from ISS Securities Class Action Services. 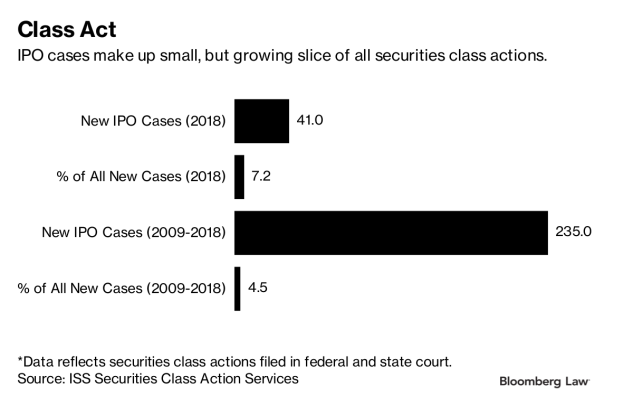 IPO-related cases also continue to grow as a percentage of total securities class action litigation brought in federal and state courts. The percentage — still a small component of securities cases — jumped to 7.2 percent in 2018 from 4.5 percent in the ten-year period between 2009 and 2018, ISS SCAS data show. When newly public corporations are sued by shareholders, it’s often for alleged violations of a 1933 Securities Act provision that holds them and their top brass liable for misstatements or omissions in certain IPO documents. These disclosure-oriented lawsuits don’t always require companies’ knowledge of wrongdoing. That means the bar is lower to file them than fraud allegations. Twenty eight companies were involved in a collective 41 securities class actions last year related to their IPOs, only two of which were dismissed, ISS SCAS data show. The percentage of IPO-related class actions that are dismissed each year has been on the decline since the early-to-mid 2010s, dropping below 20 percent in 2016, 2017 and 2018 after at least eight years at or above 35 percent. “IPOs in general are not too heavily litigated,” Kesten said. Several big names are prepping to hit the stock market this year, although their plans could be delayed if the partial government shutdown persists. Lyft said in December that it filed confidentially with the Securities and Exchange Commission to begin the IPO process. Uber has done the same, according to Bloomberg. Home rental matchmaker Airbnb Inc. and social media firm Pinterest Inc. are reportedly planning to file for an IPO. But timing may not be on their side. Depressed or uncertain public markets can sway investors’ appetite for IPO litigation, attorneys told Bloomberg Law. “When the market goes down, litigation increases — that’s just a general rule,” said Ellen Holloman, a global litigation partner at Cadwalader, Wickersham & Taft LLP. Large waves of securities lawsuits tend to crop up after major market downswings, which proved true after the 2008 global recession. Following the burst of the dot-com bubble in the early 2000s, more than 300 companies were sued for their IPOs in a one, consolidated class action. Stock price volatility is a major risk businesses must also consider when pricing their IPOs. A prolonged drop in share price after an initial listing — caused by lackluster earnings reports or other factors — is one of the most common triggers of securities cases. If a listing price is too high to maintain, there’s a greater chance that a stock drop could soon follow. However, if a company prices its shares too low, it might miss out on millions of extra dollars. Companies can combat these risks by holding off on IPOs until market conditions improve. An increase in access to private capital has made it easier for many businesses to grow while skirting the legal and regulatory costs of being publicly traded. Companies can also try going public with protective governance structures to mitigate the financial impact of stockholder litigation. Blue Apron Holdings Inc., Stitch Fix Inc. and Roku Inc. all became publicly traded with provisions in their organizational documents to shuttle securities cases to federal court — typically seen by companies as a more favorable venue for such lawsuits. An ongoing case alleges that the provisions violate Delaware’s corporate law, and a state court judge in December rendered them invalid. The case is on appeal to the Delaware Supreme Court. This, at least for now, takes the option of limiting venues off the table for Uber and other companies incorporated in the state. There’s always the possibility that IPO companies try out mandatory arbitration provisions, an oft-debated tactic for avoiding disclosure-based securities suits, attorneys told Bloomberg Law. Investor advocates have long argued against the strategy, but a company could decide to test where courts stand on the issue. After a much anticipated Supreme Court ruling last year, states maintained concurrent jurisdiction over certain securities lawsuits, which can’t be removed to a federal court. This means companies are likely to face some claims in state court while dealing with related claims in federal court. Holloman said plaintiffs lawyers are sure to react to the decision.